It is by studying a cell, an organ or a skeleton that we realize the beauty of it. Bones comes in a variety of shapes with a complex internal and external structure. They are strong, hard and lightweight. Being inspired by the principles of their composition, Bones Furniture develops into sculptured objects. Attracted by the bones organically structure and its material, the porous mineral calcium, it recreates the boneâs honeycomb matrix to generate secrets caves, smooth surfaces, natural shells and sculptured daily objects. 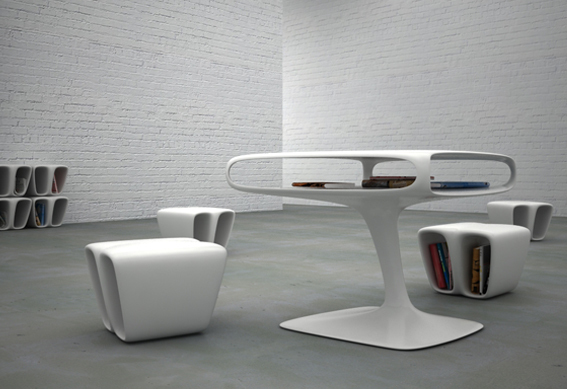 By combining the complexity of biology and the expressiveness of three-dimensional design, it shapes pieces of furniture as tables, chairs, shelves that can be used both in interior and public spaces. This collection shows a stylish range of practical furnitures - objects that can accommodate and provide storage for various items.